The Ministerial to Advance Religious Freedom in the U.S. State Department, Washington, D.C. Millions worldwide suffer due to severe government restrictions to religious freedom. WASHINGTON, DISTRICT OF COLUMBIA, UNITED STATES, January 9, 2019 /EINPresswire.com/ -- International religious freedom was given formal support and funding by an Act of Congress in 1998. It had its own subcommittee in the House. Congressional offices were staffed and responsive on religious freedom. On September 11, 2001, all that changed. As the nation focused on the War on Terrorism, religious freedom was no longer a priority.That’s quite ironic, because international religious freedom may be the only way we can really eliminate both terrorism and regional wars. Back during the Clinton Administration, Thomas Farr was the first Director of the State Department’s Office of International Religious Freedom. He witnessed the changes that occurred after 9/11. Stability and national security: concepts that unite doves and hawks and bridge the war on terrorism over to world peace and economic growth. In other words, international religious freedom, which costs millions and not trillions, may be the true key to stable peace and prosperity in the world. At the October 2017 hearing, Farr also recommended Sam Brownback to be confirmed by the Senate as the next United States Ambassador-at-Large for International Religious Freedom. Brownback was confirmed on January 24, 2018 and took on the challenge and opportunities of his new position at the U.S. State Department. Settling into his new position, Ambassador Brownback called on the International Religious Freedom Roundtable, a civil society coalition working specifically to help faiths in need around the world.The group is a true bipartisan coalition of dozens of faith organizations and other nonprofit supporters of religious freedom working together to help bring about freedom to believe and practice one’s faith in all countries around the world. Roundtable meetings with Ambassador Brownback last an hour. They have an agenda, and anyone can speak. Details of violations of religious freedom are brought to the attention of Brownback and his staff and suggestions on how to mitigate them are shared. This relationship became highly productive in the months that followed.On May 2, 2018, Mike Pompeo was sworn in as Secretary of State. Under the leadership of Pompeo and Brownback, and with the support of the International Religious Freedom Roundtable, the idea was born to launch a U.S. State Department Ministerial to Advance International Religious Freedom.This was a major advance, as it brought together governmental and nongovernmental religious freedom adherents determined to bring freedom to all faiths. This collaboration resulted in the convening of the first-ever Ministerial to Advance Religious Freedom held in late July 2018. A ministerial is very high-level, and this ministerial was no exception. 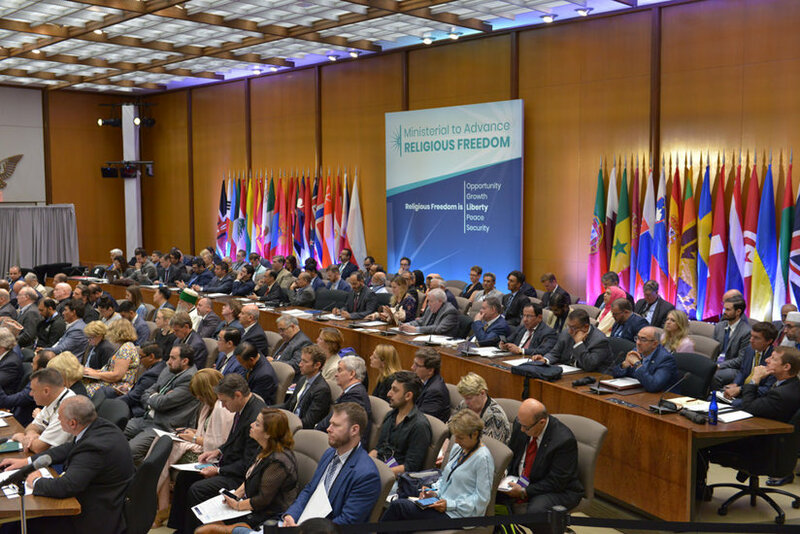 The three-day event convened over 80 ministerial-level delegates from around the world to discuss how religious freedom contributes not only to national security issues, but to economic growth and peace. The first day of the conference was devoted to equipping and empowering civil society organizations, and to understanding better how to secure U.S. financial support for their efforts. Over 300 Roundtable participants and others joined Ambassador Brownback and speakers at the State Department. The second day was devoted to “lessons learned.” Personal stories of attacks and abuses on faith communities and members were shared, highlighting the need for immediate action by not only the U.S. Administration but governments of foreign countries. The final day was devoted to a plenary session of the delegates, focused on: (1)identifying global challenges to religious freedom, (2)developing innovative responses to persecution on the basis of religion, and (3) sharing new commitments to protect religious freedom for all.To supplement the Ministerial, the all-volunteer Roundtable helped organize 32 side events all over Washington to highlight abuses of religious freedom in key countries. Here’s an interesting evolution in the culture of international religious freedom: while “tolerance” was the watchword some years ago, it has been replaced by “respect,” not only among the participants of the Roundtable but by government officials as well. Those working together to advance religious freedom are from a vast array of faith traditions and, while we may not agree theologically, we “respect” one another’s right to believe and practice their faith; we seek to understand their faith and stand in solidarity for their rights and against the horrible abuses many are facing internationally. Participants of the Roundtable come from all facets of society, from those who manifest no religious beliefs to faith adherents, and all are supported by academics, government leaders, congressional staff and others. The strong coalition shows the world the importance of coming together, no matter your political leanings, to show solidarity and insist that all faiths and people have the right to believe and practice their faith. The partnership of civil society and government continues to be a powerful tool and the Ministerial to Advance Religious Freedom was a major step forward in advocating international religious freedom to make the world a more peaceful and prosperous place. 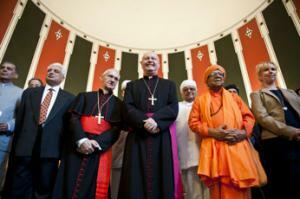 International religious freedom blossomed in 1998. It fell into disuse after 9/11. Its renaissance in 2017 came with a recognition that it is a vital tool to promote the security of nations and peoples. With respect overriding tolerance, faith can become the keystone of peace and prosperity throughout the world.